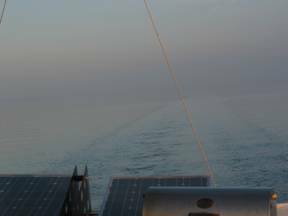 On Saturday, June 4, 2005 we were ready to begin our 5-month shakedown cruise before setting out to cross the Atlantic Ocean and circumnavigate the Earth. The weather forecast was not great, but not anything to worry about either. The preparation had been somewhat stressful. There was a long list of projects to complete (install diesel furnace, replace diesel fuel lines, install solar panels, delivery of a new dinghy and preparation of it for our davits, regular maintenance tasks around launching a boat, closing down land-based life, and provisioning the boat with supplies. We seemed to spend as much time on things that were not on the “to-do” list as those that were on the list. There were more trips back to Toronto than we wanted or anticipated. 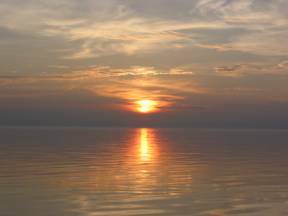 By the time the first of June came, Brian’s retirement from IBM (April 1) and Jane’s consulting contract conclusion (April 15), were easy compared to the work effort to get Pilgrim ready to sail. We were eager to shed our stresses and set out on our cruise. Although the sky was overcast, there was nothing in the weather forecast to stop us from leaving. We filled up the fuel tanks at 1400 and left Midland with great relief. Since there was no wind, we motored the entire way from Midland to the Bustard Islands. Other than going through a spectacular display of lightening, thunder and a downpour (which had not been predicted in the weather forecast) our trip was routine. 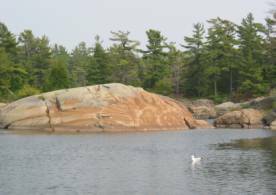 We anchored in Bustard Island Harbour with one other sailboat from Parry Sound. We slept until mid-afternoon; the other boat was gone by then. We had anticipated cold water and weather during June, so were surprised to find the water relatively warm (68 degrees Fahrenheit) and the air very warm; warm enough for a swim. Tuesday, June 7. Monday’s weather was unsettled: some rain, overcast, windy. We spent the day on the boat; reading and doing some basic maintenance tasks, including Jane’s first climb up the mizzen mast at anchor in a fairly strong wind. Tuesday we explored in the dinghy. Brian did some fishing (no bites). Jane found purple lady slippers and many healthy blueberry and strawberry plants, but no evidence of fruit yet. Wednesday, June 8, 2005. The day dawned blustery and overcast. We had talked about leaving the Bustards, but the wind was strong, around 20 knots. We did not feel like uprooting the anchor. On the other hand, the wind was from the east, and we were traveling west, which is unusual. We decided to leave. We had a marvelous sail for about two hours. Then the wind dropped, and by 1500 we decided to motor-sail the rest of the way to the Lansdowne Channel and our next anchorage, Snug Harbour. As we passed the northern tip of Badgley Island, we observed how much more of the top of the island has been blasted away, crushed and transported to Midland and from there goes to build houses and other buildings. 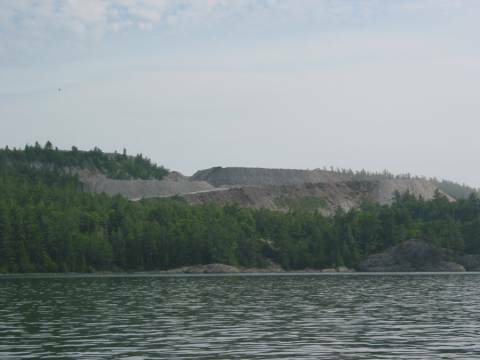 When we were in Midland, we watched freighter after freighter arrive with its load of Badgley Island limestone (talk about moving a mountain). We maneuvered our way into Snug Harbour’s tricky entrance, made more difficult by the angle of the sun. Shoals seemed to loom up where we did not expect them, and we discovered the next day many of them were optical illusions. There were no other boats in the harbour. We anchored in the middle in 30 feet of water since it is 23 feet deep right to the shore where the bugs are. Bathed below; the water temperature was 61 degrees Fahrenheit. Thursday, June 9: We did some dinghy exploring and chores, and then moved up the Channel to Covered Portage Cove, one of our favorite anchorages. The weather was warm and humid, with a blue sky overhead and haze on the horizon. 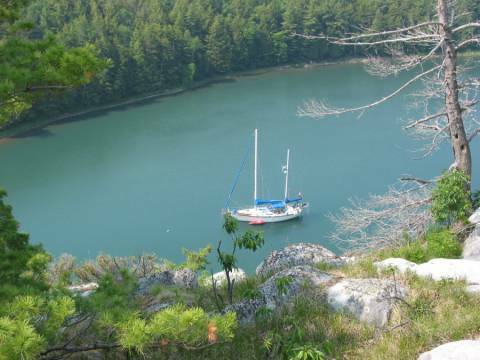 There were two sailboats in the cove; during July and August there are often 30-40 boats at anchor. 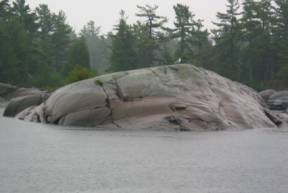 We dropped our hook right next to the spectacular “cliff” of limestone that Jane climbs to get cellular phone service (now called “Telephone Hill”) in just 7 feet of water. I’d like to see them try to move ”telephone hill” ... It seems every boat that has ever sailed the North Channel has had a picture taken at this spot. An easy trail up the side gets you to the top … maybe even a bear to greet you. Just remember who else eats blueberries and strawberries and for them it’s not just a snack. This harbour just barely keeps us afloat. The water level is a few inches higher than last year, .019 meters above chart datum. We observed 5 very noisy Ravens on the cliff, and the beaver we have seen before in this spot. The horse flies are annoying, but are not lethal biters. They seem to like blue (our enclosure, our bucket, blue shorts, blue jeans) and buzzing our heads (more like dive bombing until they hit something) when we go out on deck. We have had some mosquitoes, but they have not inundated the boat and us yet. The flies are the main bug problem. Friday, June 10. The weather was still hot and hazy, quite unsettled. We climbed the cliff (230 feet) and noticed animal droppings. Brian believes they were either a Moose (highly unlikely that a Moose would even try to venture on such terrain) or a Bear. We have observed both Common Mergansers and Canada Geese (some with goslings). Having never seen ducks and geese during July and August in the area, we are surprised every time we see them. During the night there was a spectacular display of lightening and a downpour. Saturday, June 11. We awoke to the water covered with yellow pollen (from pine trees? ), sandfly larvae, and seagulls (hundreds covering the water). We thought the seagulls might have been finding small fish brought up by the rain, but then figured they were eating the larvae since we had spotted no fish. We spent about 3 hours doing our laundry with our Wonder Washer and wringer. The weather cooperated and did not rain on our drying clothes. We spent the rest of the day exploring in the dinghy and kayak, Brian was again unsuccessful at his game of chance … fishing. Jane and her sports mobil... now if she would only carry a radio so that Brian could keep tabs on her whereabouts…The kid loves exploring off the beaten track. Sunday, June 12. 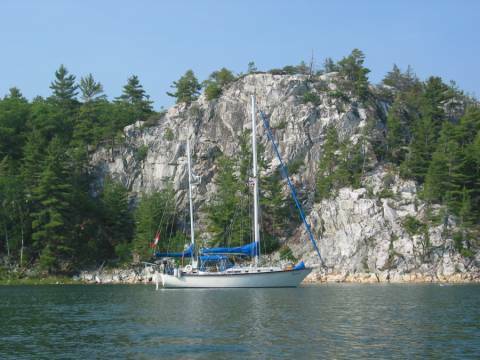 We left Covered Portage Cove, motored down the Lansdowne Channel, and then unfurled the Genoa for a gentle sail across Fraser Bay to the entrance to Baie Fine, a fiord with white limestone cliffs studded with green pines. It takes several hours to sail down the entire fiord; we went about a quarter of the way and anchored on the south shore in Marianne Cove. This spot usually has 20 boats anchored in it ... there were 2 powerboats this time but they soon left when they saw us anchor (a sailboat ... well … there goes the neighborhood). 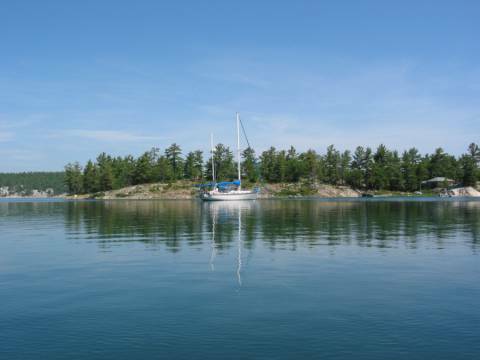 This anchorage is one of the best- protected spots in Baie Fine. This is one of the two guesthouses and is separated from the main cottage. The main channel is seen in the distance. Notice the rain gently falling.. The water temperature was 74 degrees Fahrenheit! 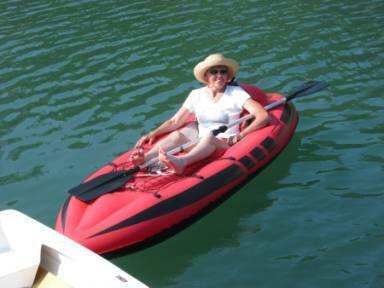 Jane pumped up the inflatable kayak and set out to explore the shore of the bay: lots of wild Iris, buttercups, bunchberries, ferns, harebells, columbines and an old beaver house. Pines with roots exposed reaching down rock faces getting a foothold into some earth. A few pines blown over during winter storms so that you could see the bottom of the trunk with attached roots, almost as though looking at the tree up through the rock. No one was in the three cottages on the island that forms the cove. 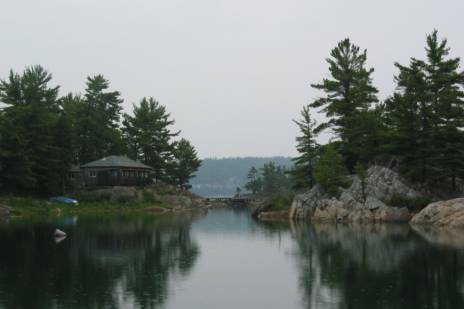 What a spectacular space, especially to inhabit it without other human beings (a very rare event in the summer for the cottage owners – imagine having 50 families set up tents in your backyard with nary a pretty please or thank you). During dinner two loons swam by within 50 feet of the boat. We were spellbound, stopped eating and just watched them settle into the weedy area of the cove. We felt this was almost like being glued to a TV set with a National Geographic special. The gulls soared overhead. The gentle south breeze occasionally sparked the wind generator into action and cooled down the cockpit. We are grateful for the screens in our cockpit enclosure that allows us to enjoy the breeze and minimize the bugs. There are still flies here, but not as bad as we found in Covered Portage Cove. Monday, June 13. It is overcast and there is only a slight breeze. It is still very hot and humid. It sprinkles a teaspoon of water then stops, then starts, then stops. We have been working on boat chores. Brian went out for a row in the dinghy and caught a small (too small) bass. He also heard a partridge in the bush (not a pear tree) and we saw a chipmunk. The loons came back into the cove in the early afternoon for an hour or so. While Brian was in the dinghy and I was in the kayak, we heard a rather loud noise from the shore. We are pretty sure it was a black bear that came within smelling range of us, and made a comment as s/he left the area. We have not seen a bear yet on any of our travels in the North Channel, and are quite happy with that state of affairs. Just before dinner, Brian tried his luck fishing again. A very large bass was lured right to the boat, but refused to bite. S/he just hid right under the boat. Brian comments, “This is an intelligent fish. The birds cannot get it under the boat, the fish is in the cool shade, and knows well enough to avoid the fisherman’s lures from above.” We had flank steak for dinner, not fish. After dinner Brian was able to pick up a CBC station on the radio. We listened to the news. Nothing seems to have happened during our 10 days out. The Gomray Commission is still underway and the minority liberal government is still hanging on by its fingernails. It’s as though nothing has happened. Or is it? Most of the media pundits carefully craft what we see and hear on “the news.” An earthquake or hurricane could have devastated some part of the Earth during these 10 days. It may have been reported for a day or two (at the most) or been shunted off for more saleable news. One of the joys (and perils) of cruising and not keeping up with “the news” is that you can remain blissfully unaware of the both the human horrors and petty political battles that are unfolding. Tuesday, June 14. The weather is still unsettled, but the sun is powering our solar panels. After breakfast we prepared to leave the cove, motored out the fiord, hoisted our mainsail and unfurled our Genoa in a gentle SE breeze. Our destination was Little Current. We have been out 10 days and have a bag and a half of garbage, a website to update, phone calls to make, banking to do, and davits to have reinforced if we can find a welder who handles stainless steel. As we cleared a buoy north of Heywood Island and altered course for the tip of Strawberry Island, the wind picked up to 15-17 knots from the South and we took off at 7.5 knots. There is a swing bridge at Little Current that we needed to pass through. It opens on the hour (more of less), and we were going to miss the 1500 bridge by about 10-15 minutes. We continued sailing to the channel that leads to the bridge, then took down our sails and drifted until the 1600 bridge opened. 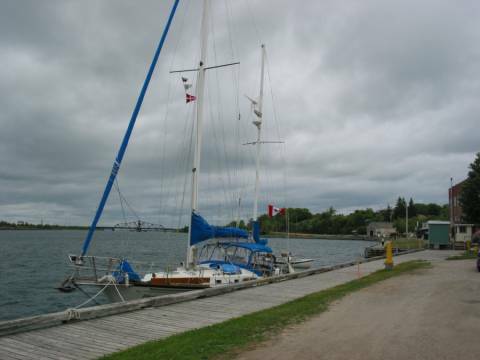 During July and August, the town dock is crowded with boats, sometimes two and three deep. We were amazed to see NO boats on the dock. In the evening, we watched a thunderstorm that has dumped a downpour of rain on us. 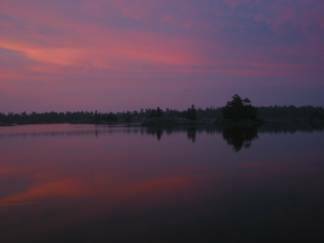 The weather report does not indicate any high-pressure areas anywhere in the vicinity from Saskatchewan to the East Coast. We do not know how long this warm, humid, unsettled weather will be with us. The sky has been clouded over for two days now. The wind at a steady 15 knots and rain at random moments. At least the thunderheads have past and we can expect marginal clearing in the next day. Notice the space along the town dock. In July and August there would be boats circling in the channel waiting for a spot to pull in. A spot would start to open up and 15 boats would head for it at full speed ... a game of chicken ... fun to watch ... expensive to participate in. Wednesday, June 15. The sky is dense with low hanging cloud, rain is still falling at random intervals and the wind is been building all day. The good news of the day ... the welder (Rick) reinforced our davits and they have been reinstalled along with the solar panels and dinghy. We should now be able to use the mizzen without fouling the support bridle (which can now be stowed away). This was envisioned as a voyage of discovery and it has certainly been that and more. A possible fix for the warm spot in the freezer is in the works thanks to a PC cooling fan from Radioshack and some plumbing fitting from the hardware store. The bottom of the freezer is –12 while the centre at the top is a balmy –3 degrees C. The fan will circulated cold air from the bottom to the top … or a least that’s the theory. If things work out the way they have to date the whole freezer will be at –3. We will know in the morning. A stern line retriever has also been fashioned out of a broom handle and ceiling hook. Jane has located 2 internet connection sites, one that charges $8.50 for 15 minutes and one that doesn’t … we will try our luck in the morning with the second site. After the update we will be heading off to Croker or Fox Islands or perhaps Bell Cove ... it all depends on the wind.